All smiles at 16 miles! 1) Don’t wear jeans if you can help it. If you do, wear a waterproof poncho or otherwise cover yourself up with plastic. Clean garbage bags will work just fine. Derelicte chic is always in fashion whenever working outside in the rain. 2) Wear waterproof shoes or boots or bring a spare pair for afterward. I wore running shoes because I was helping at a marathon. Bad idea. Unlike the runners I didn’t have to run, but like all of the runners, my socks and shoes got soaked. All that fancy breathable shoe mesh technology is useless after stepping in a few puddles. 3) Plastic is your friend. If you must carry a cell phone keep it in a zip-top baggie until you need to use it. Or store it in another waterproof bag. If your purse/bag/backpack isn’t waterproof put that in some sort of plastic bag too. To keep my things dry I used a vinyl reusable swag bag that I got last summer at a triathlon expo. One caveat is to avoid storing your valuables in a garbage bag unless it’s very clear to others around that your garbage bag is not to be pawed through or thrown away. Finally, even if you are wearing a waterproof jacket with a hood, wear a poncho on top. A dry volunteer is a happy volunteer. 4) Expect to get wet or accept that it may happen at some point. I had a poncho and umbrella and still got rained on. Once I realized I was as dry as I was going to be, I accepted it and focused on hydrating the runners rather than trying to avoid the quickly forming rivers in the street gutters. With that simple change in focus, everyone won. 5) Avoid hypothermia. Take off as much wet clothing as reasonable as soon as you can. Though I’d layered three tops– long sleeve, short sleeve, and light jacket– plus my waterproof coat and then a poncho, I ended up wearing home just my short-sleeved layer because all of the other layers had gotten wet. After I wrung out my socks I drove home barefoot for the same reason. 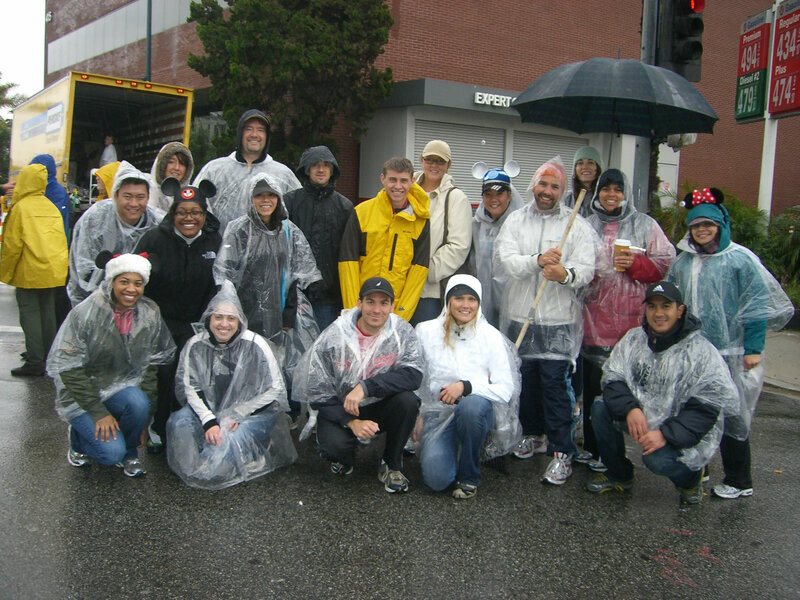 Weather issues aside, the LA Marathon mile 16 water station was well organized and racers and volunteers were troopers the whole time. It took about an hour and 15 minutes from the start of the race until we saw the first racers. When they appeared in the distance everyone ran to a spot at the edge of the street and cheered them on. The first wave of racers were in modded wheelchairs. My photos came out blurry so I won’t bother posting, but I almost shed tears at the sight of the athletes zooming by, knowing that a lot of them had been lying face up in the rain moving those chairs for 16 miles at that point. After a loud clap of thunder I saw the elite men, women, and then a little while later, a huge mass of runners. I held out water– holding the cup by the bottom, to make it easier to grab– and waited. And waited. It seemed like all of runners were stopping before or after me to get water from other people and I was so looking forward to giving water to someone! Oh, well. We cheered people on and called out the names printed on their bibs if we could read them. Some looked up at the sound of their name and smiled at us or even ran a little faster, which made me feel happy. Then out of the corner of my eye I saw a gloved hand reaching for my water cup. Then it was gone. That was the best feeling. I quickly went to the table and came back with another cup and waited again. I imagine the thrill was similar to fishing (I’ve never been). I had so much fun doing that and cheering for people, I didn’t mind when the rain began stinging my numb outstretched hand holding the water cups. I saw a few friends who were heading toward mile 26 and was happy to see them in good spirits that far into the race. I searched for a few more I didn’t see and eventually picked up my stuff and walked a few blocks to my car feeling like quite the soggy sponge. The whole experience was pretty amazing. If I had some sort of guarantee it wouldn’t rain… I could see myself running one. There, I said it. That’s all I’ll say on that for now. Here’s a news roundup of LA Marathon coverage from the LA Times. This entry was posted on Wednesday, March 23rd, 2011 at 6:15 am	and tagged with la marathon, postaweek2011, volunteering and posted in Uncategorized. You can follow any responses to this entry through the RSS 2.0 feed. Congrats, lady! I wish I could’ve spotted you. I did see your fb update when you passed 20k though.